We here at IAC 38 strongly recommend use of a protective helmet and fire resistant suit & gloves when flying aerobatics. Below are some possibilities and items that have worked for some of our members. A great source for the HGU series military issue helmet is Flight Suits Ltd. Flight Suits is also a popular source for nomex flight suits. 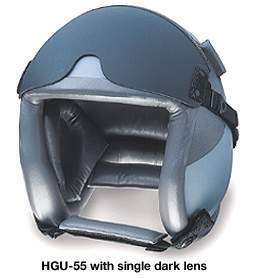 The most recent issue helmet, the HGU-55, comes in standard military grey, but can be painted just about any color you choose including custom designs. Flight Suits also sells the older model, the HGU-33. The HGU series sells for anywhere between $500 and $1000, depending on what options you choose. Count on at least $800 for a decent setup. You can occasionally find some good deals in the Flight Suits clearance sale. Currently in use by three or four of our members, the David Clark Flight Deck Crew Helmet is very lightweight and smaller in size than some of the bulkier helmets, and is no taller than a regular headset. 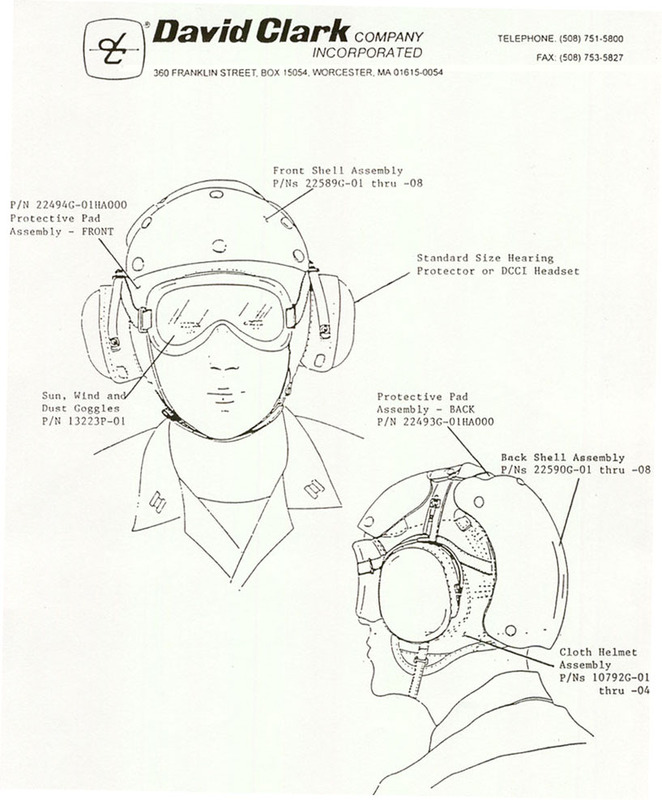 This is the same helmet in use by Navy Aircraft Carrier Deck crew. It utilizes a standard DC cloth "Snoopy hat" with snap-on padding and hard plastic shells. Click here for full drawing of the helmet assembly. 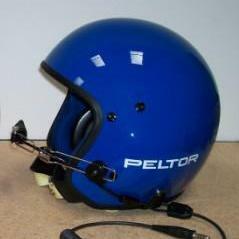 This helmet is not a standard off the shelf item - it must be special ordered from a David Clark vendor. My last experience was with a company called Western Safety Products in Laguna Beach, CA. Their phone number is 949-497-6629, ask for Harry Kiakas. You will need to know your hat size, and choose a color. Then, select one item from each list below (except for the very last 2 items). Assuming you already have a headset, you will be ordering 5 things - the cloth helmet, front & rear pads, and front & rear shells. The entire assembly, minus headset, will cost about $350. It may seem complicated, but it's not. You will have to assemble the whole thing, though, which is very easy. 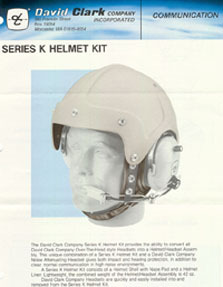 The Series K helmet is an off the shelf item, widely available from better pilot shops. It accepts a standard David Clark headset. 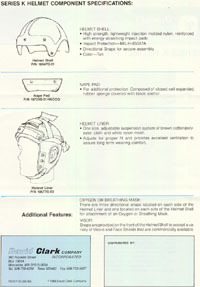 There are also snaps in the front of the shell to accomodate a visor. Click the thumbnails below for the 2-page David Clark brochure. These cost about $340 at Chief Aircraft. The Pyrotect custom suits which use Dale Antiflame� Material as well as Nomex have been reported to be better than the conventional Nomex military flight suits as the Dale Antiflame� material withstands a longer exposure to flame than does Nomex. While Nomex breathes better, it is designed for applications where a speedy egress can be made (ie ejection seat) after only a very short flame exposure. In general aviation we don't have such a luxury and for may want to consider something more fire resistant than the purely Nomex suits. The military style flight suit has lots of pockets, and is typically made of Nomex fire-resistant material (however this protection is designed for flash fire exposure, for longer GA type fire exposure . 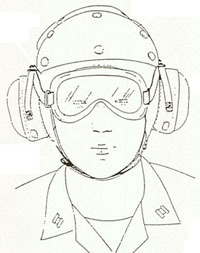 As with the helmets, an excellent source for military flight suits is Flight Suits Ltd. Flight Suits Ltd. also offers different colors. They also sell the popular GS/FRP-2 Nomex gloves. SeeFlight Suits website for more details. A great low-cost alternative for these suits is a military surplus store, or even auction sites like eBay.com. A word of caution, however - over time, with many washings, the Nomex material can start to lose some of its fire-resistant properties. 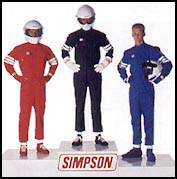 The Simpson race suits are specifically designed for race car drivers, but work equally well for pilots. The Simpson suits are available in a few different fabric weights, and they also offer a full line of gloves and shoes that have been very popular with aerobatic pilots. Check out Simpson's website for more. While a parachute is required for IAC competition, the FARs do not require wearing one in single-seat aircraft. We here at IAC 38 strongly encourage the use of parachutes at all times in aerobatic flight. Just about all of our members go to Allen Silver in Hayward, CA for parachute needs. Allen has been in this business a very long time, and really knows his stuff! He is an authorized dealer for the Softie line of emergency parachutes by Para-Phernalia. Give him a call at 510-785-7070. See Silver Parachute's website at http://www.silverparachutes.com/. If you have or know of other safety product options, we'd love to hear about them. Send an email to Brett with details.